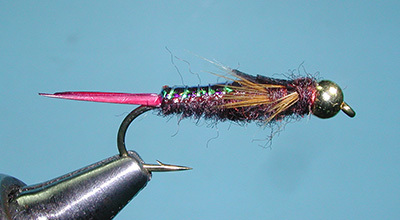 This is an important stonefly nymph pattern designed by John Barr. Stonefly nymphs can be within a river or stream system for 1-4 years. They are always available to the trout as a food source but are considerably available once they migrate up to the shoreline just prior to hatching. Often they get caught by the current and are swept downstream. 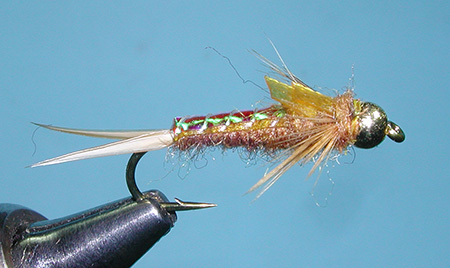 John basically ties two variations of the Tungstone, a light (Golden) color for the Golden Stones and a dark coloration for Salmonflies on a 3x long nymph hook. These can range from a size 6-18, depending upon the type of stonefly that the fish are keying on. Some stonefly nymph patterns are large, in size 2-6, but there are many stonefly nymphs that are much smaller in the size 6-18. The Tungstone pattern ties well within these smaller sizes. Bead suggestions: Use 5/32" beads for size 6 & 8, 1/8" beads for size 10 & 12, 7/64" for size 14, 3/32" for size 16, and 5/64" for size 18.